How you store your medications can affect their quality and safety. The location is also important to consider when factoring in children and teenagers who reside in the household. Sometimes it can be a bit of a balancing act deciding on a safe method of storage while still having easy access to your medicine cabinet contents. With a bit of thought and effort, however, it can definitely be accomplished. You can find boxes and plastic containers that have a snap down lid. Some people find these sufficient on their own for storage but it's best if you keep the boxes in a locked cabinet. The boxes themselves are really effective for adding in an extra barrier to keep medications secure and safe from kids. They also serve to organise your medications-for example, all cough and cold remedies might go in one box and all allergy ones in another. If you add on clearly written labels with large print, you will find that access is quick when you need it most. The lids aren't completely childproof but they do require a bit of effort to open and so are best viewed as an extra supportive barrier to keeping your medications safe, rather than a primary barrier. This is a point that can never be stressed enough. Many injuries and fatalities occur each year from accidental overdoses because a child was able to access the cabinet. To keep medications safely stored, make sure your cabinet is high out of a child's reach, but still comfortably accessible to adults in the home. Also ensure it has a lock and check periodically that the lock is in good working order. You may think your teenagers are old enough to responsibly use medications but the rise in the use of legal medications for getting 'high' is reason enough to keep the cabinet locked and to monitor your teenager's access. 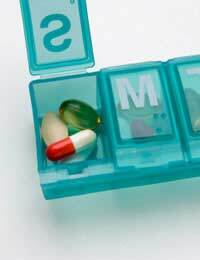 Many people store medications in a bathroom cabinet. This isn't, however, the best option for storage. The humidity and heat in a bathroom can affect the efficacy of your medications, whether they are prescription or over-the-counter ones. The moisture can also destroy capsules and degrade medication storage containers. Aim to install a locked cabinet high up in an alternate room, avoiding the bathroom and kitchen. Medications should be stored at room temperature, in a dry place and away from sunlight, unless otherwise directed. It's also important that you keep lids firmly closed to prevent contaminants and moisture from entering. Never freeze a liquid medication because this can inactivate the drugs, rendering the medication ineffective. If you're travelling, keep the medication with you rather than putting it in your checked luggage. This will protect the medications from the extreme temperatures present where luggage is stored. If your luggage is lost, you also run the risk of your health suffering because you can't access your medications. In addition, if you are going on a long journey and your medication requires refrigeration, you will need to store it safely in a cooler box. Medications can heal but never forget that they can also harm. By storing your medications safely, you can maintain their effectiveness and quality as well as protect children from access.